Our normal thinking (concerning material and worldly things such as money, family, etc.) is very mundane. We rarely have time for deep contemplation, to renew our spiritual connection or to meditate on our life choices. Satsang, or company of the wise, through listening to lectures, reading books of Masters, and being in their presence, helps to induce in our mind inspiring and enlightening thoughts which can uplift and change our thinking, creating positive thoughts and inspiration in our minds. These beneficial influences and teachings can come through books, scriptures or, best, through living teachings. Main satsang hall at the Sivananda Yoga Farm. Swami Sivananda’s method of teaching is “Little…little”. He doesn’t recommend doing too much of the same practice, thus avoiding the egoism which comes with specialization, but recommends doing a little bit of each practice all day long, promoting well-rounded development and avoiding extremes. This practice also allows you to use your time for sadhana most effectively. Thus the mind is not saturated and receives a variety of different energies to keep it at a high and positive wavelength. The format of satsang followed by the International Sivananda organization is the same format of satsang taught by Swami Sivananda in Rishikesh. In the International Sivananda Ashrams and Centers, we read from the teachings of Master Sivananda and Swami Vishnudevananda. Often times, one of his disciples who has imbibed the teachings will give a discourse on a particular topic of Yoga philosophy and practice. Spiritual teaching is a matter of Guruparampara (transmission through a lineage of teachers and disciples) and therefore it is the norm that the teachings of the Masters are highlighted, and the present and living teacher acts only as their instrument. By following this spiritual discipline, we preserve the purity of the teaching and avoid personality worship which can corrupt the teachings of the Masters. You can experience the Sivananda satsangs and much more by signing up for a Yoga Vacation which is offered year-round. Satsang gathering at the Siva Hill temple on top of the Sivananda Yoga Farm. In classical Yoga, the practice of Yoga is linked intimately with the practice of meditation. One needs to resort to meditation to find answers in life, as our mind always leads us to frustration and makes us experience over and over again the same difficulties. It is only through meditation that we can shift our mind into new, helpful grooves, change ourselves deeply, and be aware of the present and our choices, rather than just living conditioned by the past or in the illusive pursuit of the future. Meditation gives us intuitional insights and connects us with a Reality and a Peace beyond the reach of Speech and Mind. That Reality is our own True Self, Sat-Chit-Ananda (Existence, Knowledge and Bliss Absolute), which is deeply fulfilling, holding the keys to all answers, without which we will feel empty and purposeless. 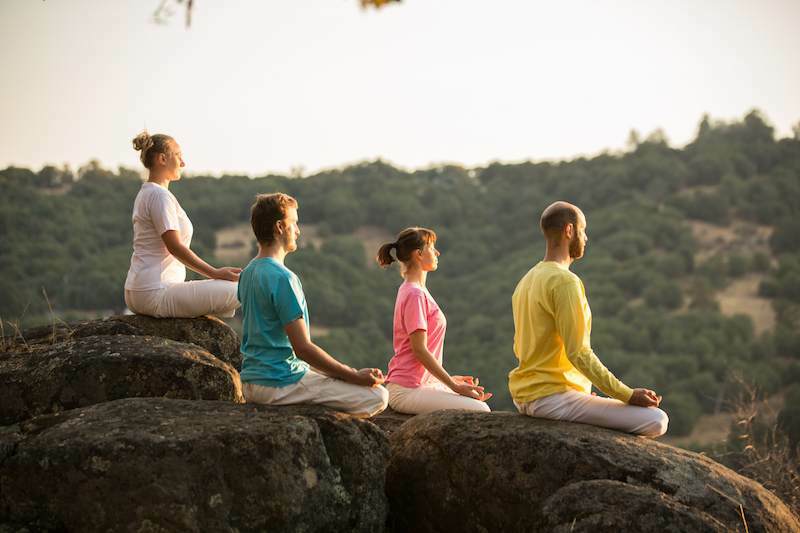 Meditation is universal, but is especially effective to those who lead a moderate, healthy and Yogic lifestyle. Consider signing up for one of our Beginner Yoga Courses to establish a solid foundation on this path. Meditation is practiced daily at 6:00 am and 8:00 pm during the Satsang. Set aside a special place for meditation – the atmosphere you build up will help still the mind. The room needs to be airy, light, clean and pure with an altar as the point of focus. Choose a time when your mind is free of everyday concerns – dawn and dusk are ideal. Using the same time and place each day conditions the mind to slow down more quickly. Sit with your back, neck and head in a straight line, facing North or East. Assume a comfortable cross-legged posture, hands on the knees in Chin Mudra with the index finger and thumb touching, or with the right hand palm facing upwards on the left palm in the lap. Sit on a blanket or a meditation cushion to alleviate the tension in the hips or the pressure on the ankles. Instruct your mind to remain quiet for the duration of your meditation session. Turn the mind within and let go of all thoughts through autosuggestion. Repeat Om three times, or chant prayers to get your mind ready. Regulate your breathing – start with five minutes’ deep breathing, then slow it down. Establish a rhythmic breathing pattern – inhaling then exhaling for about three seconds. The breath needs to be rhythmic, silent, comfortable and imperceptible. Slowly let the breath reduce itself down to an imperceptible rhythm. When the breath becomes calm, the mind automatically becomes calm. At first let your mind wander – it will only grow more restless if you force it to concentrate. After a while, if the mind gets distracted, you can gently bring it back to your point of focus or to your mantra. Be gentle and relaxed. Do not fight with your mind. Repetition of a mantra will create new grooves and uplift your mind from the usual patterns of thought. Now bring the mind to rest on the focal point of your choice – either the Ajna or the Anahata Chakra. Once chosen, always keep the same point of focus in order to channel the flow of energy always in the same pattern. This is an inner focus on a certain energy center, and it is not a visual looking that involves the eyes. The eyes are kept closed and relaxed. Applying your chosen technique, hold your object of concentration at this focal point throughout your session. The mind cannot focus without an object. In meditation, we need to increase the vibratory level of the mind by focusing the mind on an inspiring object which one holds dear in one’s heart. This conscious exercise of concentration will help to counteract the natural distractions of the mind while giving you what you want. It is true that what you think is what you become; therefore, choose a pure object of focus. The most inspiring thought that would lead you to self-realization is the pure vibration of the name of the divine, a sacred mantra. If you do not have a personal mantra (if you have not been initiated into a mantra) then use the universal mantra Om, which you can repeat mentally along with your breath while concentrating your energy at your chosen point of focus. Om is the sound of unity, the basic vibration of the universe, the sound of your breath itself. Focusing on Om in silence will lead you to a place of contentment and harmony deep within you. Meditation comes when you reach a state of pure thought, but still retain your awareness of duality. After long practice, duality disappears and Samadhi, the superconscious state, is attained. Meditate for half an hour daily, starting with 20 minutes then up to half an hour, once or twice daily. You can learn more by signing up for one of our upcoming Meditation for Wellbeing courses. The Sivananda Yoga Farm is on 80 acres and has many beautiful quiet spots to practice meditation. The main practice is to meditate daily without expectation. The practice of Yoga asana leads to the practice of Meditation. It is one and the same. To really go deep in this practice you can consider one of our 5 or 10 day Yoga Meditation Certification courses. During the Satsang we practice kirtan chanting for about 30 minutes playing the daily chants and a few select bhajans. Chanting kirtan is a devotional practice that helps to uplift the mind, open the heart, and help us to remember the meaning to our life. It is the fastest, easiest and most joyful way to achieve peace of mind. The mantras are mystical universal sounds that resonate with our chakras and remove negative energies. So, it is important that we chant so that we can benefit from this powerful healing energy. It is not about our ego or our self, but it is about chanting the name and the glories of God. We need to chant to express our devotion to something higher than ourselves to open our heart. We need to open our heart daily to the Supreme so that we can live in Peace and Compassion with all. These kirtans are very old chants composed of mantras which have been given to us by sages and saints. They are in the Sanskrit language which is the language of the Gods, a universal language with pure vibrations corresponding to the vibrations of our chakras, our vital, subtle energy centers. See the section on Bhakti Yoga to get a more detailed explanation on this method of devotional yoga. The Sivananda Organization uses the method of call and response, where the leader of the kirtan chants first and the rest of the group follows out loud. The musical instruments generally used are the harmonium, tables, tambourines, and other percussion. To learn to chant, you need only close your eyes, and practice following the sounds, without worrying about how you sound. Beginners can follow along in the Kirtan book, but the book needs to be held so that you can sit erect and connect to the breath. It may be best for you to buy the Kirtan book and CD so that you can bring it home and listen to it daily. Don’t worry that it is in Sanskrit or that it is culturally foreign or that you are not a good singer and you don’t have a good voice. Eventually you will pick up the chants, and develop a liking for particular chants that correspond to your own inner vibration. It is a devotional, intuitive approach to meditation and not an intellectual one. By signing up for a Yoga Vacation you will experience Kirtan twice a day, morning and evening. The Daily Chants are chants invoke the main aspects of divinity which are in the universe and within us. Though they are Hindu gods, they are not only for Hindus, but represent the subliminal spiritual archetypes within our minds and personalities. Every one of us resonates on a subtle level with a certain vibration and everyone in reality is divine, but we forget ourselves, and chanting the names of God links us with our true divine nature. The different gods represent the different manifestations of the same Supreme Reality. Not everyone has a different way of expressing oneself in daily life, but in spiritual life, we find out that our expressions are different from one another. If you would like to learn more about this philosophy we have upcoming Bhakti and Music retreats that focus on this theme. The logo on the left was created by Swami Vishnu and has 2 hands holding flowers and has the upward facing triangle to raise to higher consciousness. This logo for the Yoga Farm has the teachings for Swami Sivananda with a person in meditation in the center. The Yogic approach to spirituality is very tolerant of cultural differences and respectful of traditions. We understand that you might come from a different spiritual background, but please try to take this as an opportunity for you to understand the concept of Unity in Diversity, and open yourself to other ways of finding union with God, whether you call it Buddha, Jesus, Allah, Mohammed, Guru, Divine Mother etc. This is what Yoga means by Union; Union with all that seems to be different than ourselves. In that union only, we find peace and health. Swami Sivananda says that Yoga is not separate from life but is the spiritualization of all aspects of life.